World Champion, Carlsen, arrives in Saint Louis. Mamedyarov and Aronian take points in opening round. Photo © Austin Fuller / Grand Chess Tour. 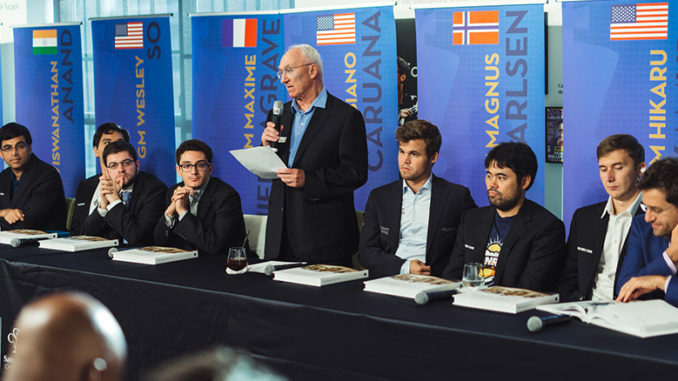 The 2018 Sinquefield Cup, opened at the Chess Hall of Fame, in Saint Louis, United States on August 17th. It is a ten-player round robin, with World Champion, Magnus Carlsen, heading the field. Also among the hopefuls, are (in no particular order): Levon Aronian, Sergey Karjakin, Wesley So, Hikaru Nakamura, Shakhriyar Mamedyarov, Viswanathan Anand, Alexander Grischuk, Fabiano Caruana and Maxime Vachier-Lagrave. This event is the last Chess Grand Tour Event before December’s final in London. I think I am right in saying that it will also be the last time we see Magnus Carlsen and his World Championship challenger, Fabiano Caruana, face each other before their match in November. All eyes on round seven, then, (August 25th), with Carlsen having White. Before that, though, there is already a great deal of exciting chess to come, I am sure! Round one was played on Saturday 18th August. Fabiano wont want too many games like his against Alexander Grischuk. It lasted for 67-moves but only netted him half a point. The home player was definitely enjoying the best of things just out of the time control, but didn’t find the right way to make it pay. From the diagram position, below, 43.Kf2 was perhaps a bit slow. A good alternative was the multi-purposed Bd6. Not only does this cover f8, (which is a handy square for Black’s King to start to centralise itself), and release the e-pawn, but Be7 is also looming after which the b7-pawn hangs. I think 43…Rxc7 44.bxc7 Be6 is not unlikely after which White can play on all day. This strikes me as a bit of a missed chance. And if Fabiano wants to be World Champion, these kind of chances are the ones he will have to be taking with both hands in November. Elsewhere, Magnus Carlsen was not having a hard time against Maxime Vachier-Lagrave. Playing White in the Sicilian Defence, Maxime was not really very ambitious and didn’t want to get into anything. His 5.h4 and 6.h5 might have seemed spicey, but Carlsen felt that he was just seeking to lock the position up and that is indeed what he did. The World Champion went along with it quite happily and they drew in 37. The other draw of the round went to Hikaru Nakamura and Viswanathan Anand in a rather uneventful Queen’s Gambit Declined. This leaves the tussles of Mamedyarov vs So and Aronian vs Karjakin. These games did produce decisive results, with both Shakhriyar Mamedyarov and Levon Aronian making the most of their first White games. Mamedyarov is enjoying very good form and still buzzing from his victory in Biel. He punished Wesley So for having too much air around his King. The problem for So can be seen in the above diagram, upon Mamedyarov’s 27.Rd6. The e6-pawn has become something of a liability and the more that one looks at the situation, the harder it becomes for So to deal with. In fact, Wesley is already quite pinned down. In the case of …Bc8, Shakh plays Rc6, heading to c7. There is not very much that can be done about this, considering that both …Re7 and …Rf7 lose. Interposing the Knight, with say …Nd5 is inadequate because White plays Rxf8 and then e3-e4. Having gone through his options, Wesley decided that 27…Bd5 was his best choice. And indeed he was correct in this; but even so, the outcome was not great. Out comes the tactic 28.Rxf6(!). After 28…Rxf6, the rather forced line of 29.Bxd5 exd5 30.Rxf6 Rxe5 31.Rxh6 Rxe3 32.Rg7+ Kh7 33.Rxg5 left Mamedyarov a pawn up. Even though this was temporary, White had the initiative and with good play that is harder to recoup. Shakh thrust his g and h pawns up the board, picked up yet another pawn and soon had the point. A well played game. Last but by no means least, the other point went to Levon Aronian, who bested Sergey Karjakin in a (let’s get ready to boo and hiss) Berlin Defence. The game turned out to be quite a lengthy affair, which is not very surprising really. The opening itself has lines of theory as big as a reality TV star’s ego and neither player is adverse to getting bogged down in it at times. After a couple of transpositions, the new move came from Sergey with 17…a5. Novelties in themselves don’t win (or draw) games, though and Sergey didn’t seem to bring very much with it. Perhaps he was just hoping for a draw, but if he was, Aronian wasn’t interested. He managed to generate play on the Kingside and bring about an endgame in which there were opposite coloured bishops and he enjoyed an extra pawn. In that situation, it was a tough save, even for a player of Sergey Karjakin’s defensive prowess. He was soon surrendering the point. The end position (below) is very instructive, showing how Black’s pieces are completely tied down to defence. Once White’s King is active, he can use the lone pawn to claim the bishop. Should it be necessary, (ie: the opponent enjoys pain), the King can then transfer to the opposite wing in support of the other pawns. Round Two (Sunday 19th August, 13:00 local time): Caruana vs Aronian, Grischuk vs Mamedyarov, Carlsen vs Karjakin, Anand vs Vachier-Lagrave, So vs Nakamura.